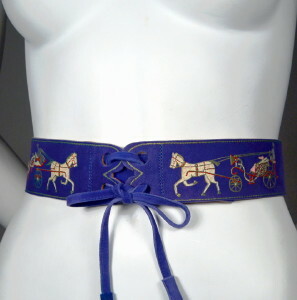 1940's vintage hand painted horse & carriage motif tie belt. Cobalt blue suede painted with white, red, burnished gold & pink, tan leather. Scallop ends with four lace eyelets. Separate self lace with wrapped ends. 5 1/2 inch self tab behind lacing. Tan leather backing. 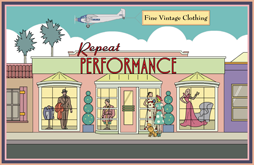 All original 1940's vintage. Uniquely forties and one-of-a-kind! Full length, including tab - 33"
EXCELLENT! Suede is supple, strong and totally wearable.